← Windows Server 2012 Essentials : Media Streaming Problems? We looked through some other relevant locations, like recent docs, or going to Word and doing a Save As to try and locate the last saved location. I got him to show me how he had opened the document, and we mapped the procedure through. It turns out he had opened the file directly from Outlook. 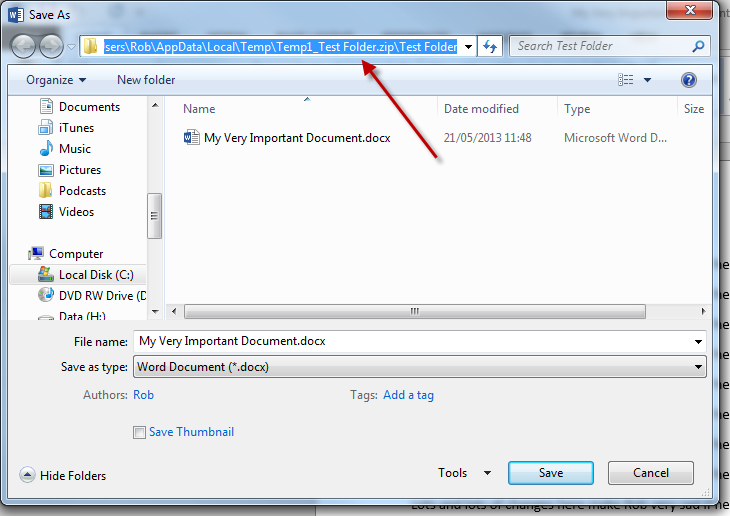 As you may know there is a special temporary folder within a users profile called ‘Content.Outlook’ this would usually be the best place to start looking for a lost file when in this scenario. Sadly the file was not there. What was slightly different about this case, was that the file, was also contained within a zip file. So from Outlook a zip file attachment was double clicked and then the file he wanted to work with was also opened, worked on and then saved. When his changes were made he saved the file. He mentioned being prompted to save with a different name because it was a read only file, so he appended 1 to the end..
By recreating the problem i was able to find the path the file was being opened from, was indeed not ‘Content.Outlook’ but a folder under AppData\Local\Temp but if you were not looking particularly for the folder you were saving in, you would not notice. 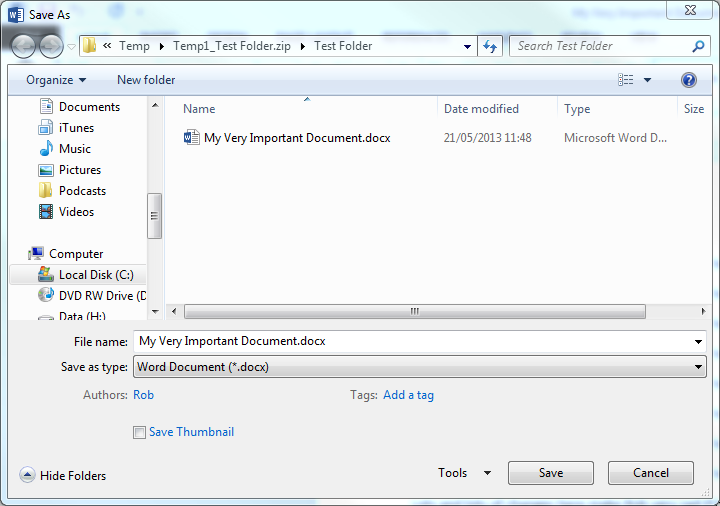 Temp1_ Being put at the beginning of the name of the zip file, then the remainder of the path being the folders within that zip file. Hope this may help you to locate a missing document! Ha Ha. Good post, Robert. Had a client do this to me last week, so still fresh in the memory. Make sure your client knows which email client they’re using. Couldn’t remote to his PC, so talked him through it over the phone. 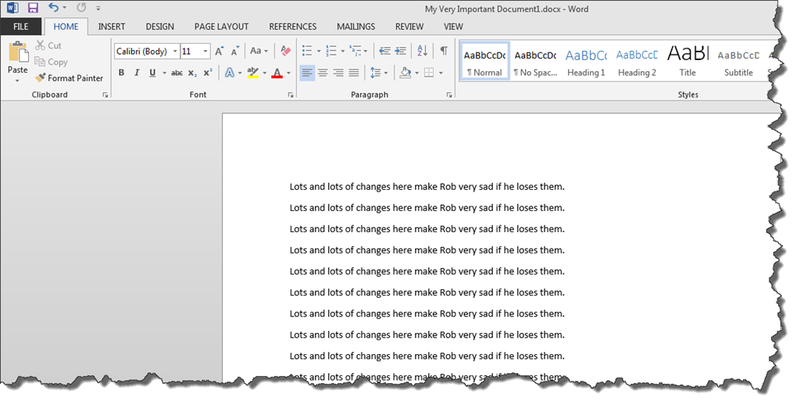 Told me he was using Word 2007 and Outlook 2007, but struggled for over nearly an hour trying to find the ‘content.outlook’ folder or registry settings. When I asked are you sure you’re using Outlook he told me, er, yes, er Outlook Windows Mail on Windows 7! Arrgh! No wonder there were no Outlook reg settings! Quickly found the relevant temp folder for Windows Mail attachments – it’s the content.ie5 folder if anyone’s interested! Good job Robert and Neil. This is definitely a good to know.